Description of "You Don't Own Me"
Have you ever imagined a soul trapped in a raped body? The pain and the agony it faces. Meet Neeti Kashyap, a 25 year old woman working as a NGO worker in Bangalore who goes through a daunting event in her past and currently is stuck with the meaning of life and problems around her. She rediscovers herself when she decides to go on a trip to Sikkim being unable to tackle the events revolving around her, on her journey she comes across a "MIRACLE" vested within a person and a group of people she feels comfort in, the journey teaches her the meaning of life in a mysterious way making her bold enough to take certain decisions in life that shapes her future. A soul trapped in a raped body, a NGO worker turned to a stand up comedian and ending up marrying the most unexpected man in her life, that's Neeti Kashyap for you waiting with a zest full of heart to tell her tale until one night in a hospital she comes across a young man who approaches her with a question May I know your Story? Uhan Barman is a young aspiring writer hailing from a small town Tura, Meghalaya, India, Currently persuading his graduation in Merchant Navy, this is vary first novel and wishes to be a successful author someday apart from writing he is an entrepreneur and is currently working on his ventures. He finds his inspiration from Nature and music and loves listening to people's stories about life and their experiences, he believes every soul has a story. He even write's quotes over his social media platform and loves to inspire people to take life in a positive manner. 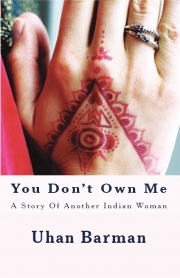 You Don't Own Me is a book dedicated to all Indian Woman conveying a strong message to the nation. Reviews of "You Don't Own Me"